Facebook Pixel lets you measure and optimize the performance of your Facebook Ads. It makes conversion tracking, optimization and remarketing easier than ever. The Facebook Pixel Destination is open-source. You can browse the code on GitHub. NOTE: Facebook has deprecated their modular “Ads For Websites” suite, which previously comprised Facebook Custom Audiences and Facebook Conversion Tracking. We’ve consolidated those two destinations into this new and improved “Facebook Pixel” destination. This document was last updated on 31st October, 2018. If you notice any gaps, out-dated information or simply want to leave some feedback to help us improve our documentation, please let us know! The first step is to make sure Facebook Pixel supports the source type and connection mode you’ve chosen to implement. You can learn more about what dictates the connection modes we support here. Search for “Facebook Pixel” within the Destinations Catalog and confirm the Source you’d like to connect to. Drop in your pixelId from the Pixels tab in Facebook Ads Manager. We’ll automatically initialize Facebook’s pixel with your pixelId upon loading analytics.js. We’ve mapped analytics.page() to Facebook’s fbq('track', "PageView") method and will forward all page views accordingly. Note that the integration will ignore any parameters you pass to analytics.page(). When you make an Identify call with Segment, it will update Facebook Pixel the next time the user loads a page on your website. Facebook Pixel does not support immediately updating user properties via Identify. When you perform an Identify call in Segment, it will update in Facebook Pixel via their Advanced Matching feature. On our analytics.js client-side integration we support all three documented methods of sending events to Facebook. To send Standard events, use the Segment destination setting labeled “Map Your Events to Standard FB Events”. Then, any time Segment receives one of the events in that mapping, it will be sent to Facebook as the standard event you specified. All properties you included in the event will be sent as event properties. You can find documentation on these events here. Facebook requires a currency for “Purchase” events – if you leave it out, Segment will set a default value of “USD”. To send Legacy Conversion events, use the Segment setting called “Legacy Conversion Pixel IDs”. Any events that appear in that mapping will be sent to Facebook with the specified Pixel ID used as the Facebook Pixel eventName. Conversion events only support currency and value as event properties, so only these will be associated with the event. currency will default to “USD” if left out. To send Custom events, send any event that does not appear in either mapping. All properties you included in the event will be included as event properties. The Segment Facebook Pixel integration supports Advanced Matching which enables you to send your customer data through the pixel to match more website actions with Facebook users. With this additional data, you can report and optimize your ads for more conversions and build larger re-marketing audiences. When the page loads, before we fire off the pixels, we’ll check for traits that the user has been previously identified with and send that along with each call. If you follow Segment’s spec, these would automatically be sent correctly. If you’re using real estate, travel, or automotive Dynamic Ads you can map category values to content_type values. For example, you might map the category “cars” to the “vehicle” content type so Facebook promotes relevant vehicles from your catalog. 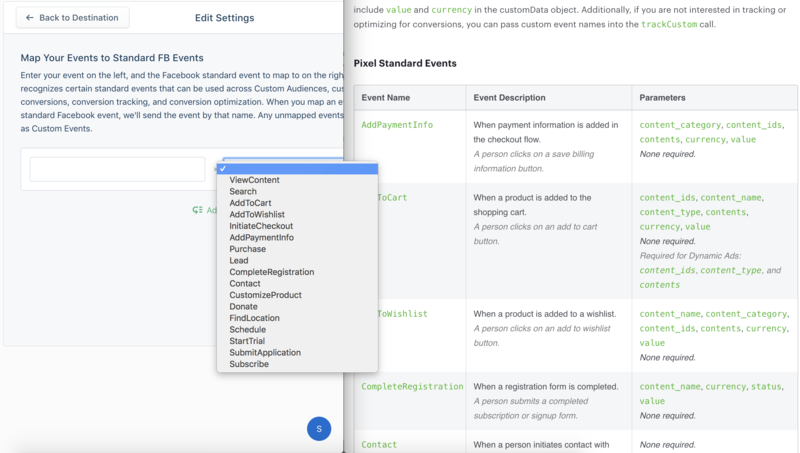 To understand which content types you can map to, consult the Facebook Dynamic Ads documentation. For most implementations we recommend leaving these mappings blank. By default, we’ll set content_type to “product”. Any track events with properties containing those keys will be sent to Facebook with those properties omitted. If you have events that use any of those keys for non-PII properties, you can manually whitelist them using the Whitelist PII Properties setting. The most common reason for Facebook conversion pixels to fire inconsistently is that the page redirects or reloads before the pixel has time to be loaded on the page. Make sure your page does not redirect or reload for at least 300ms after the conversion event happens. In some cases a delay of 500ms is necessary. We recommend using our trackLink or trackForm helpers to delay the page redirect. Documentation here. You can extend the delay by setting the timeout to 500ms. This may be due to conversion events being sent from your development, staging, or testing environments. We recommend setting up separate source for each environment. That way you can either point events to test conversion pixels in Facebook Conversion Tracking or turn off Facebook Conversion Tracking completely in non-production environments. Double check that your mapped conversion events aren’t happening anywhere else on your site. If the user reloads the conversion page or re-triggers the tracked event they may be double counted. Facebook’s conversion reports count view-through conversions as well as click-through conversions by default. You can change that setting inside Facebook Conversion Tracking in the report attribution settings. Facebook counts conversions per person, as opposed to Google Analytics which counts per browser cookie session (unless you’re using Google Analytics User-ID). If someone saw or clicked on your ad on a mobile phone then later came back directly to purchase on a desktop machine Google Analytics wouldn’t know that this was the same person, but Facebook would. In that scenario Google Analytics counts 2 unique visits with a conversion last attributed to a direct visit on desktop. Facebook counts one conversion with the conversion properly attributed to the last ad click/view on mobile.